Dice and fry off the bacon pieces. Drain, cool and crumble. 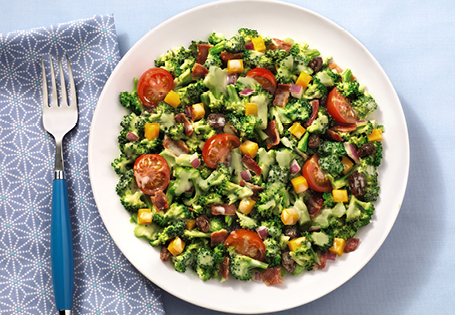 In a large bowl, toss together the broccoli, almonds, sultanas or dried cranberries, red onion, peas and bacon. In a separate bowl, whisk together the yogurt and honey. Combine the yogurt and honey mixture with the broccoli salad and chill. Add cherry tomatoes to serve.